The Honda CB300R will turn a new page in Honda’s India story today. A stylish, naked motorcycle, the bike is a scaled-down version of the bigger, Honda CB1000R. 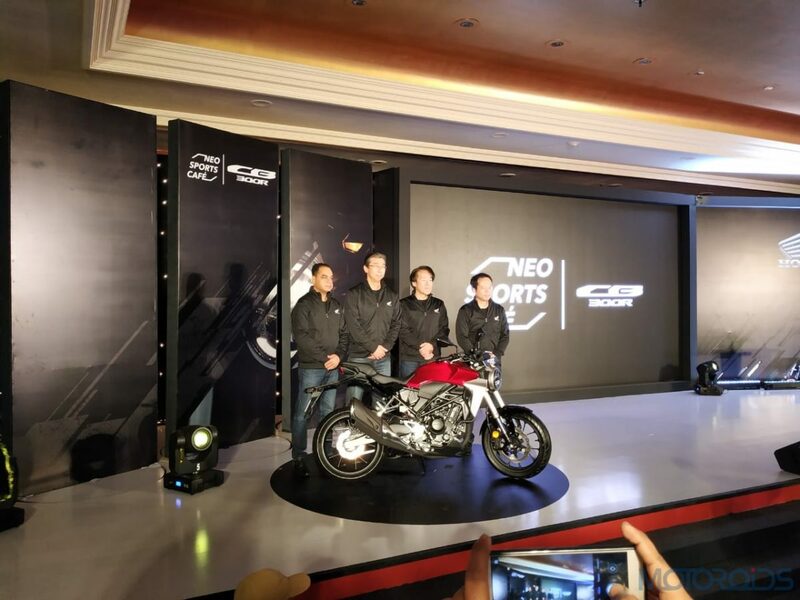 To be imported in the CKD form, it will introduce the Indian audience to Honda’s Neo Sports Cafe design and is powered by a 286cc, DOHC, liquid-cooled, single cylinder engine which cranks out 30.9 bhp @ 8,000rpm, with peak torque of 27.4Nm, delivered @ 6,500rpm. 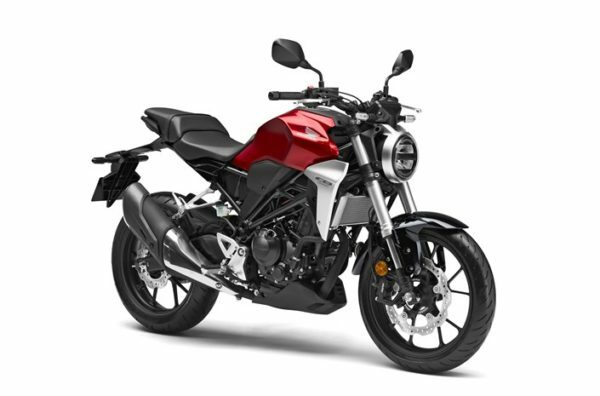 Mated to a 6-speed gearbox, the CB300R promises to cover 0-200m in 9.2s. We are at the launch venue and this page will be updated real-time with updates from the event. In the meanwhile, you may scroll down to read more about the machine or watch the live stream below. The engine powering the Honda CB300R is fuel injected. With a compression ratio of 10.7:1, 38mm throttle, and a straight-shot intake path, the motor promises to deliver crisp throttle response across the rev range. To keep maintenance costs low, the engine is also designed with the minimum number of moving parts. Details like the low-friction piston rings, high-density core radiator and iridium spark plug help increase fuel efficiency. Fitted with a 10-litre fuel tank and rated for fuel economy of 30.2km/l, the CB300R can cover over 300 km on a tankful. The bike weighs 147 kilos (wet), which results in class-leading torque-to-power ratio. 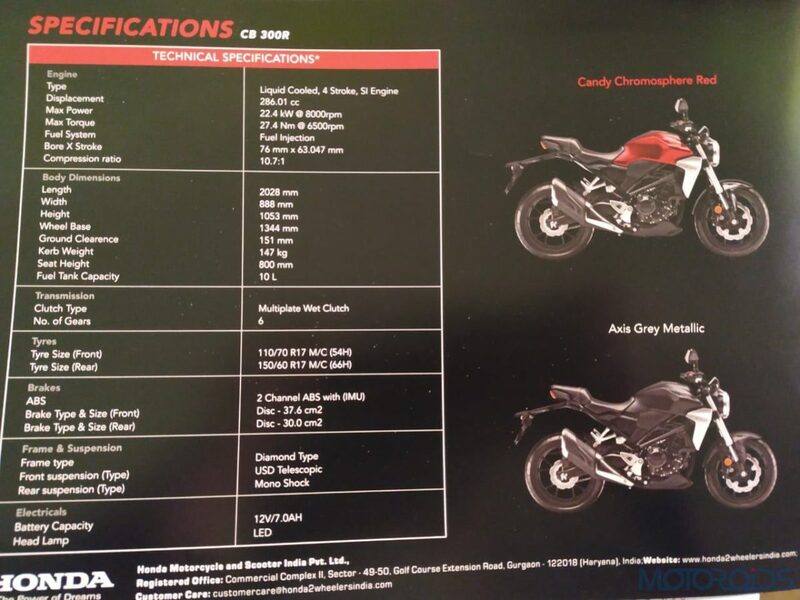 Bookings for the Honda CB 300R are now open at select dealerships for an amount of INR 5,000. 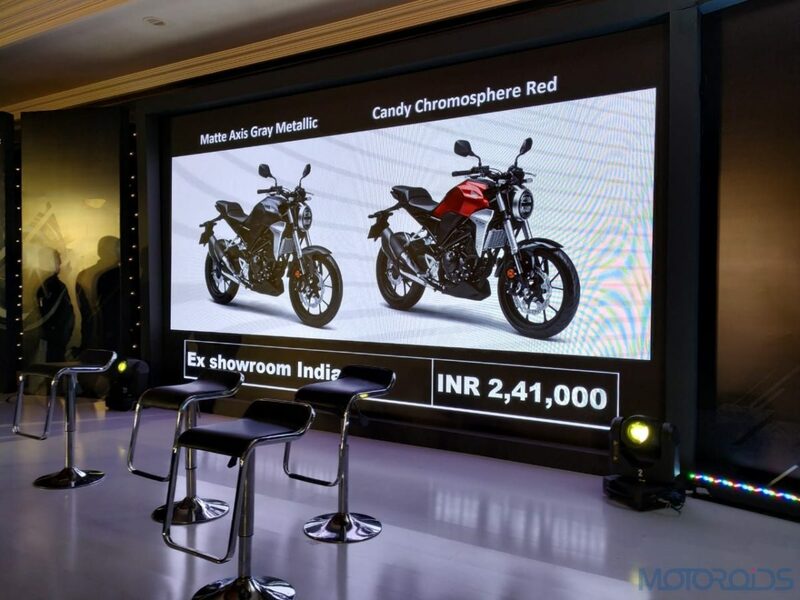 The motorcycle will be priced under INR 2.5 lakh and will be available in two colour options – Matte Axis Gray Metallic and Candy Chromosphere Red. To be priced under the INR 2.5 lakh mark, the new Honda will go against the KTM Duke 250, prices for which start at INR 1.78 lakh. However, once the KTM 250 gets updated with ABS, expect a hike. 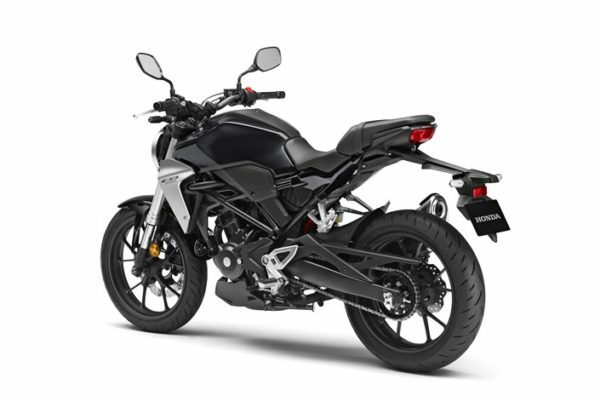 In terms of dynamics, the Honda CB 300R is based on an all-new steel tubular frame, gets 41mm upside-down front forks and the headlight, taillight (thinnest among all Honda bikes) and indicators are all LED. The rear monoshock is adjustable for 5-steps of preload and is paired with a pressed-steel swinging arm. The wave-style 296 mm front disc brake is radially mounted and is bitten into by 4-piston caliper. At the rear, the bike gets a 220 mm unit and braking is governed by a 2-channel ABS system which is linked to an IMU (A segment-first). 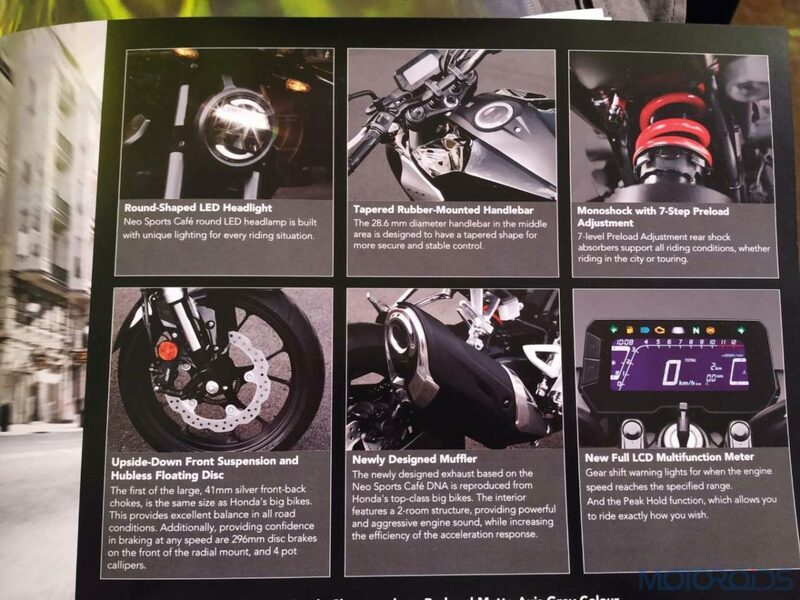 A blue-backlit LCD display takes care of instrumentation and the handlebar next to it can turn the bike around within a radius of 2.3 metres.